How important is light? Most of us would agree that without it we wouldn't be able to function in the world, especially as we do. Looking back into history, human beings used to rise and retire with the sun out of pure necessity. We couldn't keep going once it got dark because lighting was an expensive luxury that required wood, oil or wick to produce. The poorer the household (which made up most), the less likely they were to have lighting available at night outside of firelight used for warmth. Sometimes even that was out of their reach. This process worked well for us. Circadian rhythms are a biological function that developed over time thanks to our natural cycles of waking and sleep. Chemical reactions are sparked by light and darkness--patterns established by evolution. Our brains recognize the time of day and impact our energy levels and homeostatic functions accordingly. At least, that is how it used to be. With the invention of electric light and the later development of handheld electronic devices, we have lost that circadian harmony. While we may have gained the valuable gift of time and 24-hour control of it, that change has come at a cost to our health. Studies have found over the years that the incorporation of more blue light and general lighting to our day is having a serious impact on us as a society. We are sleeping less, eating more and getting sicker. All of which could potentially be happening, in part, because of our circadian rhythm disruption. What else happens when we don't get enough REM sleep and our brains don't function as they are supposed to? We lose a lot of our drive to progress during our day. You have probably heard of light therapy in the past. This is used for people who suffer from seasonal depression, to help them produce more of the brain chemicals responsible for happy feelings and contentment. 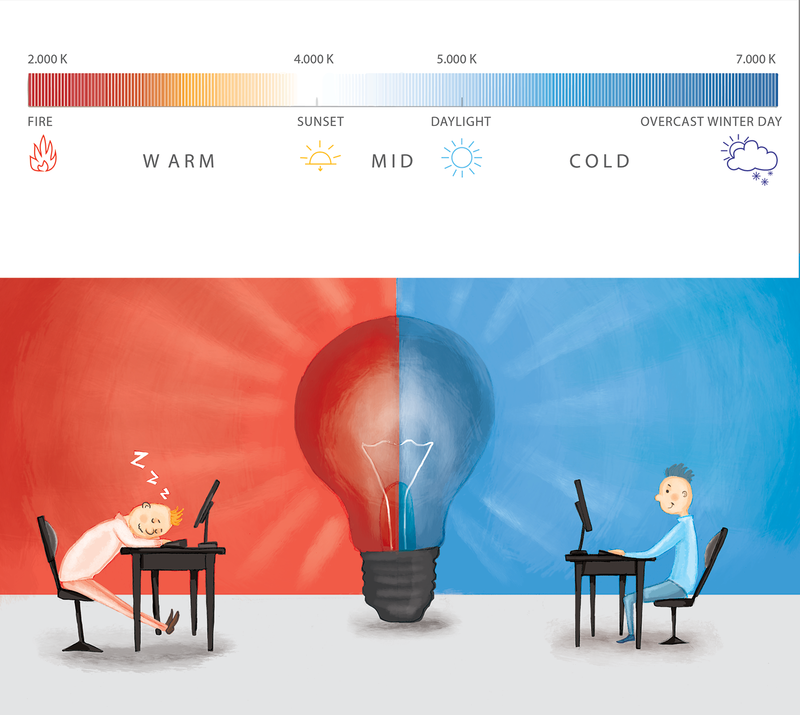 Further studies have looked at how else lighting can impact mood. One fascinating research study found that changing the lighting in each part of an office can actually change the productivity of workers and how they feel by the end of the day. Warm Color (2,000 Kelvin - 3,000 Kelvin) - Possessing red and yellow tones, this is one of the brighter lighting choices that can be made. Light bulbs in this lighting category include soft white and warm glow. Mid-Range Color (3,100 Kelvin – 4,600 Kelvin) - Used in many businesses, this cooler white light bulb style promotes a more alert feeling than the warm colors do. But it isn't on the extreme end, being more middle of the road. Includes bright white and cool white bulbs. Cool Color (4,700 Kelvins - 7,000 Kelvins) - Also known as daylight, these are the brightest lights you can comfortably use in an office setting. They promote the most alertness and focus and come in variations like daylight. Looking at that list, you may be thinking that every light in the office should be a cool color to make your workers more efficient. But that isn't the way to go. To get an overall healthy and well rounded lighting scheme, you need to put different lights in different rooms. Think of it this way: if you are on high alert at all hours of the day, how are you going to feel at the end of it? Strained, tense, irritated, maybe even depressed. Certainly your stress level is going to shoot through the roof every time you walk into the building. Does that sound like the description of a happy and high functioning workforce? Of course not! Your employees have to be able to relax from time to time. They need periods of less productive thought and interaction. Spaces where they can calm down and connect on a personal level, or be more at ease while dealing with the social aspects of the job. Warm Color - to be used in break areas and bathrooms, where employees need to be able to relax while in there. It also brings a comfortable, relaxed air to the room that helps boost satisfaction. Mid-Range Color - Perfect for areas where communication happens but alertness doesn't have to be high. For instance, a conference room where you gather to discuss things through the day or week is great for mid-range color. So are offices where the bulk of work is communication based, such as HR. Cool Color - Used in rooms where more alertness is necessary. Think of meeting rooms where ideas are exchanged and creativity is needed, or a hospital ward where your staff has to be focused or people could get hurt. It isn't just productivity that is impacted when we have a proper lighting scheme like the one above. Employees will be in a better mood and less stressed. Their eyes will be less strained, which means less eye pain and headaches. They will sleep better, which, as we have already seen, has a heavy impact on health. Think of this as an additional step to taking care of employees and helping to boost company morale. The benefits are so inclusive and far reaching that it will mean only good things for your brand. Lighting isn't just a design choice. It is a decision that can have some real implications on mental and physical health, stress levels, sleep, happiness, productivity and a lot more. As studies continue to see the implications widening for light therapy and customizable lighting, companies are beginning to take notice and make changes for the sake of their employees. The number of businesses now using programmable lights is one example of that. So if you want an easy way to boost morale and health at your company, consider changing the lighting. Yes, it really is that simple.